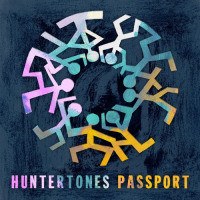 Huntertones' Passport is an absolutely seamless piece of work. The integration of the material with the playing and, by extension, the arranging and recording, becomes evident in the first minutes of "Clutch" and remains pervasive for the duration of this, the group's third album. Even so, there are readily-discernible dynamics at work here. The aforementioned opening track swings from the sweaty to the sunny and breezy, then back again. Led by saxophonist Dan White, trumpeter Chris Ott and trombonist Jon Lampley , Huntertones' music is clearly inspired by the band's international travels and cross-cultural collaborations, so it's little suprise this LP a truly international co-production by the group itself with Greek composer Magda Giannikou, founder of Banda Magda. Mixed by Nic Hard, who won a Grammy for his work with Snarky Puppy, tracks such as "Bird Song" and "Togo" boast colors supplied by members of that eclectic band, keyboardist Justin Stanton and percussionist Keita Ogawa; the latter cut in particular suggests how Huntertones balance the rhythmic components of their music with its tuneful melodic leanings. It's a credit to the group's confidence they avoid the temptation to render their largely-instrumental sound more "accessible" with conventional singing. The exotic vocal of Hope Masike on "Hondo" is anything but. The woman's voice(s) intermingles with the horns as another instrument in the mix. Similarly, varied textures like that of a kalimba intertwine with Fergal Scahill's violin on the aptly- titled "Fergal's Tune" and while those Celtic strains sound much more mainstream than much of Passport, the pronounced drive of "Parusha" is in line with the generally more esoteric (though a bit diaphanous) sonic structures here. John Hubbell's propulsive drumming supplies a foundation upon which Joshua Hill layers brisk and bracing electric guitar, around which the rest of the band coalesces with the same unity on display within the preceding nine cuts. Track Listing: Clutch; Bird Song; Togo; Hondo; Star of the East; Fara; Bad David; Change; Fergal's Tune; Parusha. Personnel: Dan White: tenor & soprano saxophone, flute, clarinet, vocals; Jon Lampley: trumpet, flugelhorn, sousaphone, vocals; Chris Ott: trombone, beatbox, kalimba, vocals; Joshua Hill: Electric Guitar: Justin Stanton: Fender Rhodes, piano, organ, synth; Adam DeAscentis: electric bass; John Hubbell: drums, vocals; Keita Ogawa: percussion; Magda Giannikou: vocals; Hope Masike: vocals, mbira, shakers; Fergal Scahill: violin, mandolin.